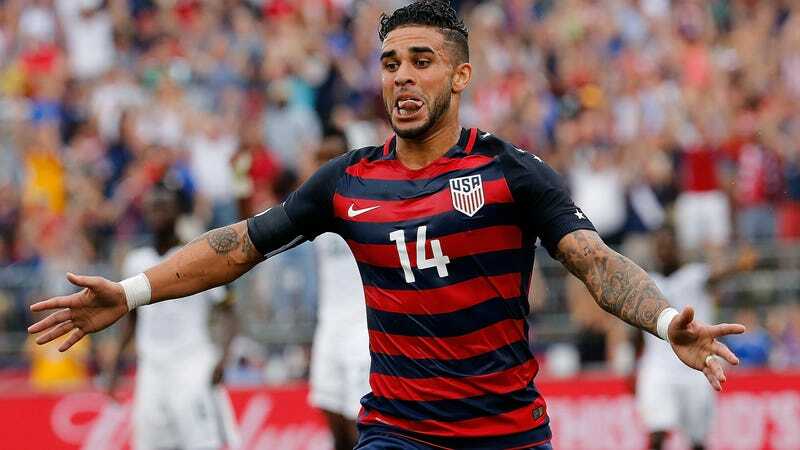 A fairly blockbuster MLS “trade” happened Tuesday afternoon, as Kansas City sent longtime striker Dom Dwyer over to relative league newcomers Orlando, who had been trying to acquire Dwyer for years. “Trade” is in quotes here because KC’s return on the deal is a hilarious combination of general allocation money, targeted allocation money, and future allocation money (don’t ask; alternately, look here if you want to stare into the unknown), totaling $1.6 million all together. Even if that all reads as utterly absurd—it should—it’s still the largest amount of money ever involved in an intra-MLS transaction. Dwyer, drafted in 2012, has scored 66 goals in 149 appearance for Kansas City, but if he was going to leave, it makes sense that he would go to Orlando. The 26-year-old went to college at the University of South Florida, and he spent a dominant loan spell in 2013 with Orlando, which was then in the second tier of U.S. soccer. Dwyer’s been a force with KC for several years now, but he’ll be recently familiar to USMNT fans. The England native just became a U.S. citizen in March, and he made a major impact in his national team debut not long after. In each of his first two games, Dwyer notched a goal. He also forms a USA striker power couple with his wife, Sydney Leroux.